An analysis of the Revolution and the “Civil War,” which left over a million dead in three years, is presented here with its emphasis on workers’ councils, those organs of revolution established by the proletariat to self-manage its own affairs. It is reprinted from Pointblank published in 1972. All footnotes are by the Fifth Estate staff. Forty years after its first victories, the Spanish Revolution remains the most significant of the various experiments in self-management which have taken place in this century. The experience of the Spanish workers’ councils forms an important point of departure for the modern proletariat, both in terms of its accomplishments and its failures. The Popular Militia of Saragosa form in the streets of Spain to fight fascism. The widespread concealment of this aspect of history made by the proletariat only reinforces its fundamentally radical character. Suppressed by bourgeois historians and Leninists alike, and distorted into an unrecognizable myth by those anarchists who treasure it as one of their “golden moments,” the revolutionary movement in Spain continues to be a source of embarrassment for ideology. The activities of the “uncontrollable elements” of the Spanish proletariat proved to be a scandal to all parties. The Revolution was eliminated long before the victory of the fascists by a combined force of Stalinists, liberals and “libertarian” bureaucrats of the very anarchist movement in whose name the most radical members of the working class acted. The Spanish “Civil War” began only after the defeat of the Revolution. The revolution in Spain represents the last stand of the traditional proletarian movement and within its history are contained all the positive aspects of this movement as well as the counter-revolutionary forces and ideologies which were to oppose it. The struggle which had developed between Leninism and the councils in Russia  was to be repeated in Spain on a larger and more profound scale. By rediscovering the councilist form in its own practice, the Spanish proletariat were the heirs of Kronstadt and the councils of Germany and Italy,  with the Spanish councils the revolutionary movement which had been defeated by Social Democracy and Bolshevism reappeared. The Spanish Revolution was an international struggle, not only in the sense that its combatants came from many countries, but because its existence stood in opposition to all the ruling powers of the world. As the Italian anarchist Berneri  observed: “Today we are fighting against Burgos  but tomorrow we will have to fight against Moscow in order to defend our freedom.” This war against hierarchy; moreover was to become a struggle against ideology in general. In understanding the Spanish Revolution, it is not a question of merely rendering its “unconscious tendencies conscious,” but in explaining the actions of a highly class-conscious proletariat—actions which were veiled in ideology, yet transcended it. The appearance of the councils in 1936 was the product of 50 years of revolutionary activity, most of it under the aegis of the Spanish anarchist movement. Yet the actual revolution marked the tactical failure of the anarchists; the expropriations of July were in response to a fascist putsch and not an anarchist insurrection. The anarchists’ faith in the powers of a general strike had largely prove to be illusory; the CNT-FAI  had failed, in rising after rising, to be capable of extending the locus of revolution beyond the parochial confines of a few cities or regions. By 1936, the ideology of anarcho-syndicalism had been shown to be obsolete; the spontaneous development of workers’ councils during the course of the 1933 Aragon insurrection and the Asturian miners’ revolt represented a practical advance upon the anarcho-syndicalist program of building a revolutionary society based on unions. The revolutionary committees of Aragon and Asturias, which had established themselves as a social and economic power in addition to their military capacities, were to reappear all over Republican Spain in July 1936 and their existence threatened the leadership of the CNT-FAI as much as the Republican government. Before the revolution, the CNT had attempted to integrate the councils within its ideological schema; the document produced by the CNT Congress at Saragossa (June 1936) was essentially a councilist program and recognized the councils as the basic organ of revolution. While advancing a revolutionary theory of workers’ councils, however, the CNT itself was not a councilist organization—the principle of direct democracy under which the councils were to operate was not reflected in the structure of the anarchist organization. While the lessons of the Bolshevik counter-revolution were not lost on the Spanish anarchists, their refusal of a “revolutionary” representation—a party holding power in the name of the proletariat—was purely formal. The matter of democratic organization was to become anarchism’s undoing. Although its explicit call for a social revolution—one in which the proletariat would assume management over the means of production without the mediation of the state—remains one of anarchism’s merits, the actual practical task of making such a revolution was beyond it. From its inception, the Anarchist movement in Spain had retained an implicitly hierarchical structure which embodied a dualistic separation of political and economic sectors. While the anarchist union, the CNT, was to organize the working-class in preparation for social revolution, the recently formed FAI was to constitute a “conscious minority” of anarchist militants. In practice, this organization was to act as a quasi-Leninist vanguard party and the latent hierarchical divisions of the CNT-FAI as a whole were to become a social reality after July 1936. The immense revolutionary activity of the anarchist masses was to be reversed in a struggle in which the official CNT-FAI was to take the side of the bourgeois Republican state and its new-found ally, the Communist party. What was accomplished by the factory councils, the agrarian collectives and workers’ militias in the year 1936 through 1937 was in spite of the policies and actions of the official anarchist organization. Nonetheless, despite the obstacles erected in its path, the movement for self-management in the Spanish Revolution provides the clearest historical example of a genuine socialism. The historical explosion that was the Spanish Revolution cannot be explained under the convenient rubric of a “Civil War;” it represented the unfolding of an acute class struggle in which the Spanish proletariat participated as much for itself as against Franco. The fascist rising was answered, not by the impotent Republican government, but by a popular insurrection which involved men, women and youth and destroyed, in less than a month, the entire matrix of Spanish society. The armed proletariat of July accomplished a de facto abolition of Church and State and replaced capitalist modes of production with economic and social forms of its own. In the subsequent year, the councils established by the working class Were to become a third force fighting against both the fascists and the attempts of the Republican government to re-establish its authority. The success of the workers’ and peasants’ militias cannot be measured in purely military terms. The period of revolutionary occupation which began-during July 1936 demonstrated the viability of the councilist form. The Spanish councils (unlike those previously in Russia, Germany and Italy) were able to pose the question of self-management practically, proceeding beyond the necessary arming of the workers to the organization of production. In the industrialized areas of Catalonia, an anarchist stronghold, the proletariat proved capable of administering and improving a modern urban economy, increasing productivity while maintaining necessary services for the population—revolutionary Barcelona is witness to the success of self-management in Spain. Similar results were achieved in the rural areas of Aragon and Valencia, where modern agricultural techniques were introduced in the process of collectivization. The most radical aspect of this movement, however, was not the simple rationalization of the Spanish economy, but the attempt made to practically realize a critique of political economy. From the beginning of the occupations, the Spanish proletariat proclaimed a communismo libertario in which money and commodity labor were abolished. In spite of admittedly primitive economic conditions, the Spanish councils and collectives were able to devise a system of distribution and exchange which represented a qualitative supersession of the relations of capitalist production. The dilemma of “economic” or “moral” incentives, a problem for the bureaucratic classes of pseudo-socialist countries, was not encountered in revolutionary Spain. The radical translation of the dictum, “From each according to their ability; to each according to their needs,” into a reality was incentive enough for the proletariat to meet and in fact excel the demands imposed by war against Franco and the Fascists. Despite differences in their individual characteristics, the councils and collectives operated on essentially the same basis: delegates were elected to perform specific tasks and coordinate production—these delegates had limited powers and were subject to recall by the general assemblies of workers and peasants, in which all important decisions were made. Besides establishing an internal democracy, the councils sought to extend their power by coordinating activities with each other; unity was created between the factory councils and agrarian collectives, not only in the militias where workers and peasants fought side by side, but in the actual federation of movements and the exchange of delegates. While bourgeois sociologists and historians have attempted to portray the revolutionary activity of the anarchist peasants as a “primitive religious movement,” one must only examine the Program of the Federation of the Aragon Collectives to perceive the advanced consciousness of the rural proletariat: “We propose the abolition of the local boundaries of the property we cultivate… unoccupied work-teams will be used to reinforce the collectives that are lacking labor power.” The Spanish movement for self-management was not a demand for simple regional autonomy—councilist federation was designed to supplant traditional authority in its entirety. The form in which the councils appeared was directly related to the organization of the workers’ militias where the principles of direct democracy had first been developed. In July, the armed columns of the Spanish proletariat were, in fact, the Revolution. Their function was as much social as military; the liquidation of bourgeois elements by the militias was not carried out “in defense of the Republic,” but as an initial step in the radical transformation of Spanish society. The militias themselves never intended to be part of a regular army; in itself, the militia structure represented a radical break with conventional modes of warfare, simply because it was organized along revolutionary democratic lines. Like the insurgent armies of the Russian and German Revolutions, the Spanish militias represented the military arm of councilist power; the soldiers’ councils, like the factory assemblies and collectives, elected revocable, mandated delegates. The non-hierarchical character of these militia columns is evidenced in the fact that differences in rank and pay were non-existent. Despite the rapid advance of the workers’ militias in Republican Spain, the social revolution which began in July failed to establish the absolute authority of councilist power. While the Republican government had been severely weakened, it did not, of course, abdicate in favor of the proletariat; after July, dual power existed in “Anti-Fascist” Spain between the forces of a new revolutionary order and the remnants of the bourgeois Republic. The councils of July had made the government virtually irrelevant and had practically superseded the syndicalist structure of the CNT-FAI; they were defeated to the extent that they failed to see the necessity of consolidating their power—a consolidation that would inevitably mean the abandonment of all traditional organization. Although the slogan of Asturias, UHP (unite proletarian brothers! ), reappeared during July and united various factions of the proletariat around a common program of revolutionary activity, ideological divisions soon manifested themselves again and prevented a lasting unity. The proletariat split along party lines, the anarchist rank-and-file and POUM  being the only ones to support the Revolution. Despite this, the revolutionary proletariat were in a majority—unfortunately, however, they did not take advantage of their position. A misplaced trust in the leadership of the CNT-FAI led to a situation where the anarchist masses were to acquiesce to the gradual abolition of their power. Invoking the Stalinist slogans of “Unity” and “Discipline,” the CNT-FAI sought to persuade the proletariat that the elimination of the councils and militias was a necessity imposed by the exigencies of Civil War. While the anarchist proletariat undertook the reconstruction of society along the lines of self-management, the official CNT-FAI was preparing to accede to its compromise. The collaborationist policy of the anarcho-bureaucrats became clear when they put aside their “anti”-statist ideology and actually joined the government. Playing into the hands of the Stalinists, who were rapidly organizing the Republican petty bourgeoisie into a counter-revolutionary movement, the CNT ministers consented to governmental action against the councils. Government-inspired municipal councils, which included extra-proportional representation for the UGT  and Communist party, were created in an effort to replace the councils of the proletariat. Additionally, the CNT leadership helped draft the Decree of Collectivization of October 24, 1936, which would limit the councils’ power; in place of self-management they proposed to establish a form of “workers’ control” in which the workers’ committees served a purely advisory role. The failure of the Spanish Revolution lies in its inability to extend itself to a point where the councils and militias would assume total control over the revolutionary movement and, as a consequence, over Republican Spain as a whole. While immensely successful in organizing military and economic affairs, the Spanish councils failed to give positive practical and theoretical expression to their own existence. Unable to define themselves in relation to the CNT-FAI, they were everywhere outmaneuvered. Every attempt at action against the enemies of the Revolution in the Republican camp was thwarted; the Stalinists and liberals were able to reconstruct the machinery of government virtually unhindered. Successive Republican ministries sabotaged the attempts at self-management, denying credit to factories, etc., without serious retaliation—the anarchist militias who were denied arms did not disarm those who were preparing their demise. The destruction of the Spanish Revolution did not, of course, proceed without opposition, but the recognition by the proletariat of its betrayal did not come until well after the initial moves against the councils and the militias. Unfortunately, the forces of the Spanish Thiers had already acted; the left-wing anarchist masses, who cooperated with militants of the POUM, did not offer significant opposition until early 1937. 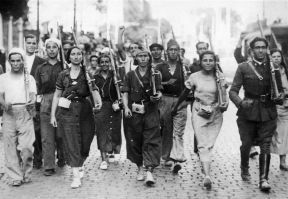 The left-anarchist group, the Friends of Durruti, conducted a widespread agitation among the workers’ militias for a defense of the Revolution. but by this time the initiative had passed from the proletariat to the forces of its enemies. The campaign of the bourgeois Republican forces (the government, the Communist and Socialist parties) against the workers’ councils became overtly violent in May 1937 when the Stalinists and Catalan Nationalists moved on the self-managed Barcelona Telephone Exchange. Following this action, the working class of the city rose spontaneously to defend their revolution; barricades were erected, the police disarmed and armed workers were in control of the city. At this point, the counter-revolution could have been reversed, at least in Catalonia. The anarchist militias at the Aragon front were prepared to march to Barcelona—victory was far from assured for the government and the Stalinists. The Barcelona workers, however, remained in purely defensive positions and hesitated to move beyond their own districts. This stalemate worked to the advantage of those who sought to pacify the situation and, as before, the central leadership of the CNT-FAI was to offer its service of “conciliation”—from the beginning of the insurrection, these recuperators urged the workers to dismantle their barricades and return to work. The CNT was resisted in its pacification program by the Friends of Durruti and others who called for the defense of the councils and a victorious conclusion to the fighting. In the months after May, these tactics were employed throughout Republican Spain. Lister’s  troops, eliminated the agrarian collectives, the militias were dissolved, the POUM was suppressed and the CNT, now expendable, was evicted from the government. The councils were defeated within a year after their appearance; the “thousand acts of heroism” of the Spanish proletariat were not enough to prevent the victory of the counter-revolution. What was so difficult to accomplish in Spain 1936, today becomes the absolute minimum for any proletarian revolution. The experience of the Spanish workers’ councils provides an example of only the beginnings of councilist power; the technical resources of contemporary capitalist society will enable the modern proletariat to accomplish in a few days what the Spanish revolutionaries were never able to complete—the self-management of the means of production. The possibilities for the radical transformation of society are that much greater now because the “economic question” can and must become a banality. Whereas in Spain “full employment” was a revolutionary goal, the success of any future councils will be measured by their concrete efforts to eliminate work as much as possible. Because of the extreme condition of emergency in which it took place, the Spanish Revolution was never a festival, even to the extent the Paris Commune was. The pleasure denied the Spanish proletariat awaits the revolutionaries of today. Beyond the economic and technical developments which separate the modern proletariat from the tradition of the Spanish councils, there remains an essential link—many of the problems encountered in 1936 will continue to confront any revolutionary movement. In its defeat, the Spanish Revolution demonstrates the role played by enemies within the ranks of the proletariat—recuperators who are not as easily recognized as the clowns of the various Leninist sects. As Spain shows, councilist power does not always succumb to an external “villain,” conveniently played by the Noskes and Trotskys of the world; the councils can defeat-themselves if they fail to take the offensive and establish their authority everywhere. The modern proletariat will avoid the fate which befell revolutionary Kronstadt or Barcelona only through an awareness of the immensity of the task which awaits it. The exemplary actions of the Spanish councils and militias could not compensate for the failure of the Spanish proletariat to perceive the obstacles which still remained in its path. The radical history of the future will be conscious or it will be nothing. 1 Upon seizing state power in 1917, the Bolsheviks began a systematic campaign to eliminate the power of the factory committees set up by Russian workers. See The Bolsheviks and Workers’ Control; Maurice Brinton; Black & Red. 2 At Kronstadt in the Soviet Union (1921) and in Germany and Italy (1919), revolutionary upsurges of the proletariat were bloodily suppressed by the ruling “socialist” powers—the Bolsheviks in Russia and Social Democrats in the latter two countries. See The Kronstadt Uprising, Ida Mett, Black Rose. 3 Camillo Berneri (1897-1937). After fleeing Mussolini, Berneri formed the first Italian units for the anti-fascist war. He was murdered on May 6, 1937 following his arrest by the Communist-controlled Barcelona police. Hugh Thomas in The Spanish Civil War, p. 428, suggests that “the assassins may have been Italian Communists” rather than the police. 4 Burgos, a city in the North of Spain—a fascist bastion. 5 CNT (Confederacion Nacional del Trabajo—National Confederation of Labor). The revolutionary syndicalist organization influenced by the anarchists having a membership of three million workers organized into trade unions. FAI (Federacion Anarquista Iberica—Anarchist Federation of Iberia). Leadership group within the CNT with 30,000 members. 6 Mikhail Bakunin (1814-1876). Russian anarchist active in European revolutionary movements and a political opponent of Marx. See his God and the State, Dover. 7 Buenaventura Durruti (1896-1936). Assassin and bank robber for the anarchist movement before the revolution; militia leader and FAI militant during its first period. He was shot to death during the battle for Madrid by what was said to be a stray bullet. Thomas, in The Spanish Civil War, p.328, suggests that it might have been by one of his own men (an “uncontrollable”) who resented Durruti’s advocacy of participation in government. However, a recent work charges that Durruti was another victim of the many Communist assassinations. Durruti’s funeral in Barcelona was attended by 200,000 anarchists. 8 POUM (Partido Obrero de Unificacion Marxista). Dissident revolutionary communist party influenced by Trotsky having about 25,000 members at its height. 9 UGT (Union General de Trabajadores—General Workers’ Union). Reformist trade union controlled by the socialists having a government encouraged membership of 1,250,000. Its members were for the large part non-proletarian elements such as government bureaucrats and white collar workers, many who joined the Communist Party when it embarked upon its attack on the Spanish Revolution. The Republican government originally saw it as a counter-weight to the power of the larger CNT. Once in the government the CNT and UGT cooperated in military expeditions, but soon both were expelled from power by the CP in 1937. 10 Adolphe Thiers, a conservative French politician, acted as negotiator between the government in Paris and Prussian Chancellor Bismarck during the siege of the French capitol at the time of the Franco-Prussian War (1871). Both agreed that the defeat of the Paris Commune, established by a workers’ insurrection, deserved priority over their national squabbles. 25,000 workers were slaughtered (during its suppression. 11 The Communist Party, with a membership of only about 10,000 at the start of the Revolution, began to take on all of the characteristics of a fascist movement as it grew in size. Franz Borkenau in The Spanish Cockpit states that the Communist Party was “to a large extent… the party of the military and administrative personnel, in the second place the party of the petty bourgeoisie and certain well-to-do peasant groups; in the third place the party of the (white collar) employees and only in the fourth place the party of the industrial workers.” According to Borkenau, the Communist headquarters in Valencia had on the wall two slogans: “Respect the property of the small peasant” and “Respect the property of the small industrialist.” The CP also had a large following among the police. This constitutes the traditional class base of fascist movements and their activity, the destruction of the gains of the proletariat in favor of the authority of capital and the State, make the Communists almost indistinguishable from Mussolini’s Black Shirts. 12 Republican General Enrique Lister did his hatchet work for the counter-revolution, then escaped to Moscow after the victory of Franco. Still alive, he recently made a pronouncement on Spain from the Soviet Union which was printed nowhere in the West with the exception of New Solidarity, the NCLC paper [National Caucus of Labor Committees, organization founded by Lyn Marcus, later known as Lyndon LaRouche], which featured it prominently and uncritically.